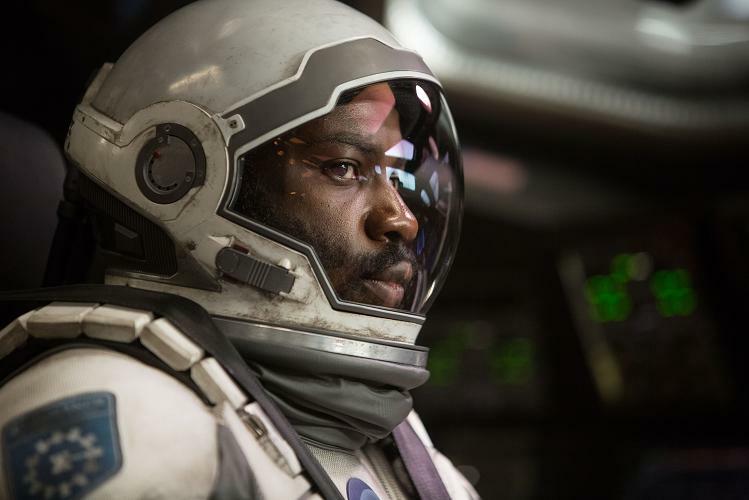 David Gyasi in INTERSTELLAR, from Paramount Pictures and Warner Brothers Entertainment, in association with Legendary Pictures. BEVERLY HILLS-Just as his character Romilly illuminates in the new Christopher Nolan’s sci-fi drama thriller “Interstellar,” David Gyasi pours out an aura of quiet strength in a recent interview at the Four Seasons Hotel in Beverly Hills. And just like Romilly, Gyasi only gives out what is needed to get the job done: efficiency, breath of knowledge and a serene spirit that permeates wisdom beyond his years. Gyasi (pronounced Jesse) shines in the Matthew McConaughey space film, bringing depth an some solid acting chops in “Interstellar.” With a steady does of work over the years in recent films such as The Dark Knight Rises, Red Tails, Law & Order: UK and Cloud Atlas, Gyasi’s talents are on full display as Romilly, as he more than holds his own going up with McConaughey, Anne Hathaway, Michael Caine, John Lithgow and Casey Affleck. Interstellar is a space, sci-fi odyssey where man meets the forces of the solar system on Earth and in the stratosphere. As Earth succumbs to cruel and unapologetic power of the environment, man searches for a way out: head to space to see if humans can survive on another planet or face the inevitable that mankind will cease from existing. This is where McConaughey’s character (Cooper) and his crew (Anne Hathaway as Dr. Amelia Brand) and Gyasi (Romilly) come in. As the astrophysict or scientist of the crew, the onus is on Romilly to stay cool under pressure no matter what is going on. Gyasi’s nuanced, powerful performance is the glue that keeps it all together and is the cornerstone to all the missing parts of the puzzle in “Interstellar” with his scientific analysis and knowledge. Gyasi’s character Romilly is unfulfilled until he takes on this out-of-this world mission with Cooper. News4usonline.com caught up with David Gyasi as he discussed his preparation for his character and the meaning of the film.